Bullish New All-Drive SEAT Throws down Gauntlet! BTN has added an ARCHIVE of road tests going back to April 2009 at the end of this report. You can also find the reviews via the Motoring Index. Don’t rock the boat, don’t upset the apple cart. Well Spain’s SEAT VW car brand has done just that! 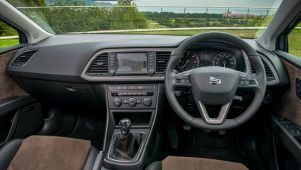 This burgeoning car maker has come out with a new model, the SEAT Leon X-PERIENCE 4x4 that is based on the still very fresh Leon ST compact estate that had me thinking all manner of expletives to summarise exactly what has arrived on the car market. From the outset of becoming part of the Volkswagen’s super progressive car creating empire, SEAT made it clear that it was creating its own character, reflecting its nationality and in recent years that has become obvious with some very attractive looking models but this latest arrival from the state-of-the-art factory outside of Barcelona may come as a bit of shock. That shock I suggest will be felt by rival manufacturers who have been plugging away mainly at the 4x4 SUV and Crossover type of cars that you either love or is not on your horizon when looking for a new car. 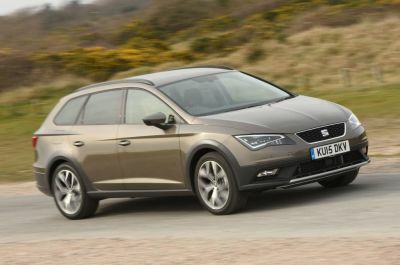 Yes, SEAT has stolen a march with the X-PERIENCE that is a stylish and exceptionally practical compact estate. 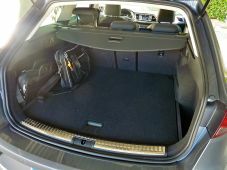 For a car originating from Spain it is a bit bullish in appearance, especially when it has sporting lifestyle equipment loaded onto the roof rails or on a rear mounted bike rack. The 4x4 transmission system is a clever arrangement when most of the time the car drives in front wheel drive mode but if grip becomes challenging successive doses of power is passed to the rear wheels to maintain traction. The effect is a positive driving vehicle that is light and responsive on the controls, very stable though a touch on the firm side for ride and with impressive grip and braking with the Goodyear road tyres fitted to the test car. Two examples are offered, the entry level version, said to be the strong seller, powered by a 150 ps/148 bhp 2.0 TDI turbo diesel engine and running through a 6-speed manual gearbox or the flagship version, as I drove, pushing out massive 184 ps/82 bhp in a refined manner and driving through the highly rated 6-speed DSG gearbox. With this sort of power the performance, I suggest, is just what the discerning driver seeks. Whether one simply lets the gears chop and change automatically, select gears via the lever or do racing type changes with the paddle shift, the driving characteristic is not only easy but with an accuracy that can be appreciated. It is quick, with a claimed top speed of 139 mph and 62 mph (100 kph) reached in an astonishing 7.1 seconds –that’s the figures but the real satisfaction that this is a completely developed product, not just an adoption of an existing model, and as such has a high level of refinement, both in performance and in the ambience of driver lifestyle and overall finish that smacks of the premium brand – as a certain Audi model is produced in the same factory perhaps the premium bug is contagious? What purpose can this 4x4 slightly sporty estate car serve? Driver delight is uppermost but there is also assured ability to cope with sudden changes of surface grip without drama and, as a result of slightly increased ground clearance, tackle some more natural surfaces with impunity. Not exactly designated for a Safari but, if fitted with all-weather tyres, a logical form of transport for those who have to venture out into the cold or living in farm track areas. The engine is the latest Euro 6 rated for emissions, includes stop+start system and energy recovery under braking/slowing and thus gets a combined consumption figure of 57.6 mpg, but realistically nearer the 40 mpg mark. It is cleverly planned with a good size luggage capacity featuring double boot floor and a ski hatch in the back of the 60/40% folding rear seats, automatic post collision braking system, LED daytime running lights (experience a daylight blizzard and it helps if the other guy can see you! ), a drive profile offering your own individual style, or Eco, Normal or Sport, hill hold control, electrically folding mirrors with reversing adjustment, and easy satellite navigation system, full connectivity, a space saver spare wheel and so much more that suggests impressive value. In summary SEAT has really jumped the gun with this new X-PERIENCE model, an achievement that should see the brand further improving on the 18% uplift in UK sales it posted in 2014. Price from £28,870 – as tested £30,615.